When students from Thomas E. Harrington Middle School in Mt. 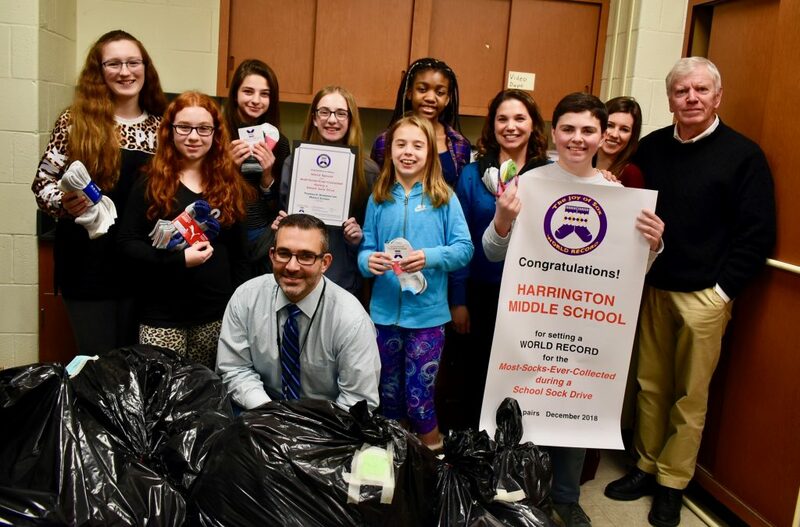 Laurel NJ decided to do a service project for the less fortunate, little did they realize that they would be setting a WORLD RECORD for Most-Sock-Ever-Collected during a K-12 school sock drive – 5,633 pairs of new socks for those experiencing homelessness. Student Council Members from Thomas E. Harrington Middle School, Mt. Laurel NJ, collected new socks for the homeless and set a Joy of Sox WORLD RECORD for the most pairs ever collected during a K-8 school sock drive. Pictured with the students is Principal Ryan “Mr. C” Caltabiano, kneeling in front; teacher Kate Mitchell, fourth from right; teacher Tracy Burleson, second from right; Tom Costello, Jr. Chief Sock Person and Founder of The Joy of Sox, on the right. Students of teachers Tracy Burleson and Kate Mitchell initially planned to conduct a conduct a community service project collecting food. However they decided to investigate other ways of helping those in need. When members of the committee found The Joy of Sox, a nonprofit that gives socks to those experiencing homelessness, they knew they had something all the students would want to support. The sock drive began in October during Harrington’s spirit week and goal of 500 pairs was set. As enthusiasm for the service project increased the socks poured in. In addition, Costello pointed out to the students that new socks can be more important than food to those living on the streets. There are many places such as soup kitchens, food pantries and generous people who can help with a meal. However the foot pain, blisters, fungus, infections, and possibly gangrene that the homeless may experience, can be alleviated with something as basic as a pair of new clean socks. Mitchell, who teaches math, did a quick calculation. There are about 955 students in the school and 5,633 pairs were collected – so the average student family donated just just under six pairs (5.84). So, perhaps, for next year, and another world record, the sock metric could be set to eight pairs or about 6,880 pairs. And then if all the 7th and 8th graders in Burlington County Public Schools participated, about 10,300 students, collected 8 pairs, that would be another 82,400 new pairs for those experiencing homelessness. Who knew that this small community service project would not only help thousands of homeless feet, and set a world record, but also develop into a math lesson? After the WORLD RECORD banner and certificate were presented some student loaded the new socks into a vehicle to be transported to The Joy of Sox warehouse. From there the socks will be separated into bags of men, women and children’s socks. The sorted socks will then be distributed to shelters for those experiencing homelessness around Philadelphia and South Jersey. About the Thomas E. Harrington Middle School. Harrington is one of eight schools and educates approximately 1,000 seventh and eighth-grade students in Mount Laurel. The schools in the Mount Laurel district receive tremendous support from the community making a huge difference in the lives of others. For more information about the Thomas E. Harrington Middle School sock drive, please contact Marie Reynolds, Director of Communications, Mt. Laurel School District, mreynolds@mtlaurelschools.org, 856-235-3387 x 3018. The Joy of Sox® is a Philadelphia-based 501(c)(3) nonprofit with the mission of giving joy to those experiencing homelessness by giving them new socks. Their vision is to be the best sock charity in the United States, and to every person experiencing homelessness in America six pairs of new socks every year. Founded in 2010 they have given over 300,000 pairs of new socks to those experiencing homelessness in 33 states and five countries. For more information please visit www.TJoS.org. For more information about The Joy of Sox, please contact, Tom Costello, Jr, Founder and Chief Sock Person, The Joy Of Sox, Tom@TJoS.org, 610-745-1075.